Your customer today is intelligent, networked and more importantly for you, fiercely fickle. Thus, delivering an exceptional customer experience is not only important but critical for your brand existence. For this, you need to know what goes into making an experience that your customers will brag about to their friends or loved ones. Here are the top seven ingredients for a great customer experience. A customer forms his opinion in the first 10 seconds of interaction. Thus, you need to ensure that every customer-facing channel or person is capable of creating a great first impression. Give the customer a comforting sense of the relationship you wish to create going forward. You exist because of the customers, not the other way around. Customers today have hundreds of options for their every need. Hence, thank and appreciate the customers for their business and it should reflect in your every interaction. Often, you will hear words like “This was my first visit to your site”, “I just happened to drop by your store”, etc. These statements signal a golden opportunity for you to develop a long-term and solid relationship with new customers. They should leave your premises with “The brand was really happy to see me” thoughts. It is one of the most recognizable and powerful customer experience quantifiable metric out there. FCR (First Contact Resolution) rates single-handedly enable increased customer satisfaction, quality adherence, and reduced servicing costs. Most of the customers' crib about waiting long for resolution, which often requires three to four contacts. CRM solutions can help you to reduce waiting time and quickly provide a final solution at the first contact. Imagine this scenario: You, with the noble intention of improving customer security, implement an identification and verification process. It’s sophisticated and top of the line, but, so unfriendly that deployment brings truckloads of customer complaints. The result? Customer dissatisfaction, increased call handling time and decreased rates of FCR (First Contact Resolution). Your policies may ultimately be for customer benefit, but unless it is communicated and implemented in a way that treats customers with respect, it will backfire badly. Today’s empowered customers demand control of their product experience. Besides visibility into the portfolio of products & services, digital CRM gives customers the power to browse, choose, pick a product or a service, buy, raise service requests, and track resolution status across channels and devices. Though some of the ingredients may be complex in nature, most just require streamlining and implementing best practices. 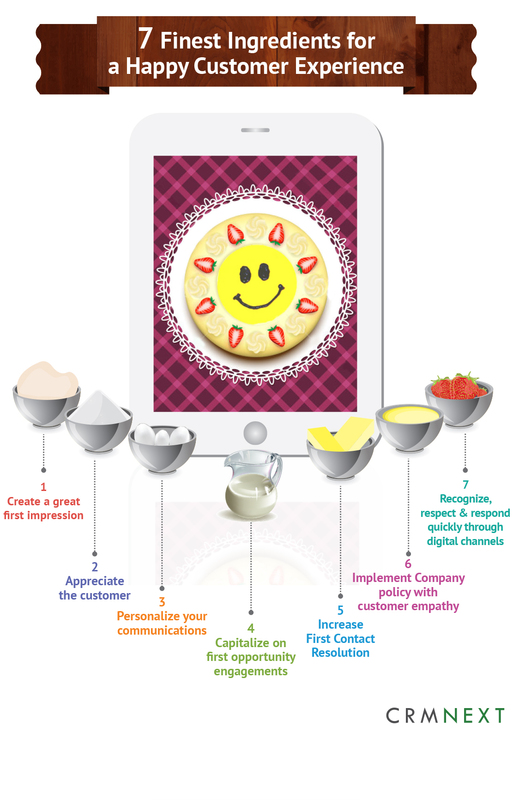 Use the above seven ingredients to dish out the best customer experience.